Mitch Haniger moved down from the Double-A Southern League to get some more regular at-bats. Now that he's wrecking pitching in the California League, opponents probably wish he'd head back up. The D-backs' 22nd-ranked prospect blasted two homers, one in a pivotal five-run fifth inning, as Class A Advanced Visalia rallied to take down Stockton, 7-5, on Friday night at Banner Island Ballpark. "I'm just trying to keep it simple like always, just trying to swing at good pitches and hit the ball hard," Haniger said after extending his hitting streak to seven games with his second straight multi-hit night. "That's my main focus every game. I can't really control anything else that happens. "As a team, I think we've been swinging it pretty good, but we've also had some hard lineouts and groundouts. You see guys get frustrated -- and I do myself -- but at the same time, when you go up to the plate and hit the ball hard, that's all you can control." Haniger hit the ball hard regularly on Friday. The 24-year-old center fielder singled to center leading off the first inning before bashing a three-run homer to left-center in the fifth and a leadoff blast to left-center in the seventh. "Ryan Hutchison and Ryan Gebhardt got it going early in [the fifth]," he said. "I came up with runners in scoring position and got a good pitch to hit and put a good swing on it. We kind of fed off that energy. I don't know whether their starter was feeling timid or what, but we were just feeding off each other's energy and got it going, swinging the bat really well." That starter, A's No. 22 prospect Dylan Covey (6-5), didn't make it out of the fifth. The 23-year-old right-hander was charged with six runs on eight hits over 4 2/3 innings. Haniger started the season strongly with Double-A Mobile, batting .281/.351/.379 in 55 games, but regular at-bats were becoming more of a rarity later in his tenure there. The D-backs sent him to Visalia for an everyday job. "It's been good to play every day," he said. "As long as you're playing every day, you can definitely find things to work on. Double-A was just a little bit better. As you move up every level, guys get a little bit better, but there's a lot of really good players down here. It's still a challenge. This game will always be a challenge, no matter where you are." 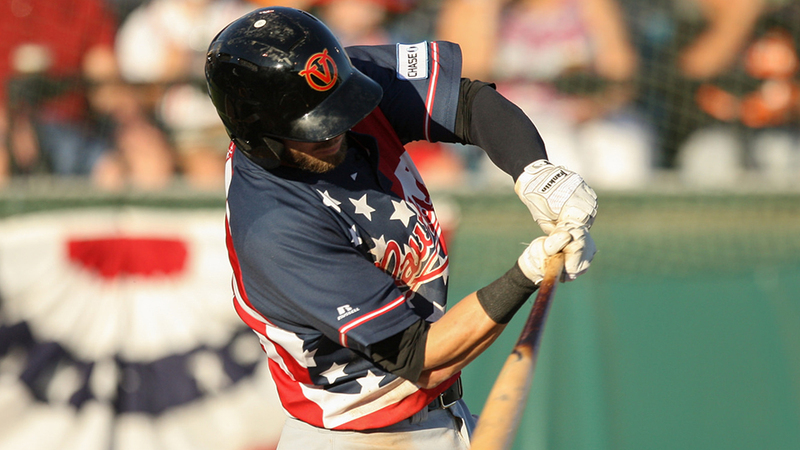 The comeback win kept Visalia atop the California League North Division second-half standings through two weeks. After a first-half title with a 42-28 record leading into the All-Star break, Haniger hasn't seen any letdown since he joined the Rawhide 14 games ago. "Some teams, in the first half they dominate and in the second half they teeter off," he said. "I think our clubhouse is filled with a lot of winners and no one wants to lose. That's the biggest thing. Going out every night, it doesn't matter that they clinched the first half. It's all about winning." Starter R.J. Hively (1-1) got the win on Friday, giving up five runs on eight hits and two walks while striking out six over five innings. Nickolas Sarianides fanned one in a perfect ninth for his league-leading 17th save.